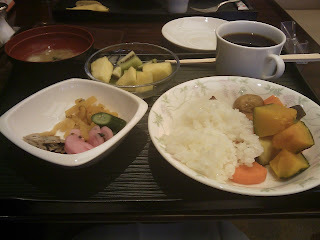 I had no problem finding seemingly vegan food at our hotel's breakfast buffet. Mr. Wright and I are going to tidy up our room and take a walk. This afternoon we take the bullet train to Kobe. Oh, I almost forgot! When I put my foot into my shoe this morning, I felt something weird in the toe. I reached in and pulled out one of Curlytop's sponge letters. Awwwww! My heartstrings definitely got tugged. When Mr. Wright travels without me, I always send something of mine with him so he'll think of me. Before he goes, I ask, "Are you carrying something of mine, besides my heart?" Turns out, I carried something of Curlytop's to Japan.